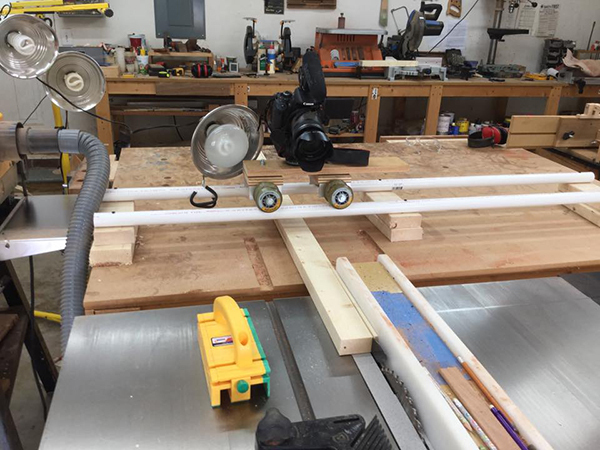 I really love the production side of making woodworking videos; probably as much as woodworking. I am always trying to think of new ways to make the same mundane repetitive shots more visually interesting. I made a new dolly recently and discovered that it would make a great bridge for some shots. This entry was posted on Saturday, May 16th, 2015 at 3:04 pm	and is filed under Film, podcasting. You can follow any responses to this entry through the RSS 2.0 feed. You can skip to the end and leave a response. Pinging is currently not allowed.